I cut the base for my card and followed with a black base layer which I distressed the edges with the Zutter DIA. 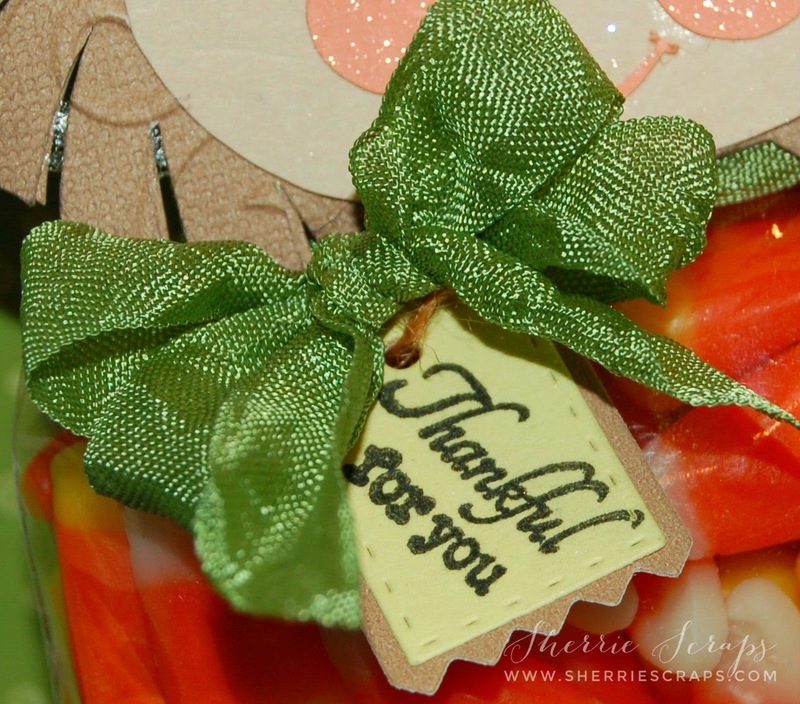 The orange layer was embossed with the chevron embossing folder and adhered in place. 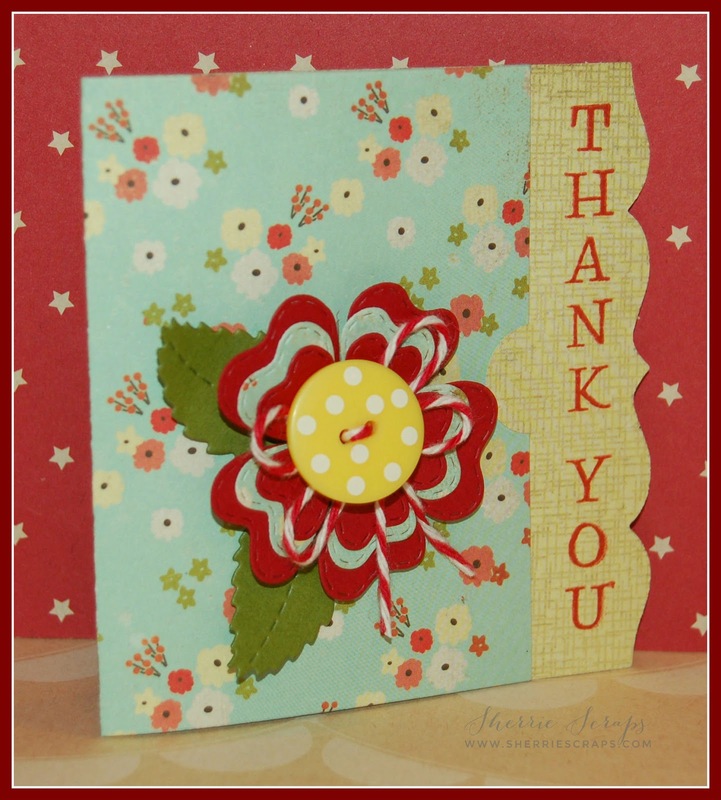 I cut a smaller piece of pattern paper that was in my scraps, distressed the edges and put in place. 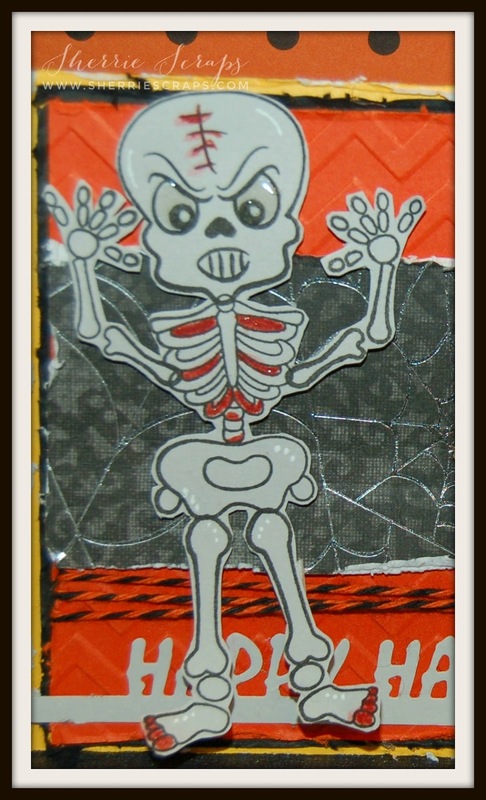 The skeleton is from PK-1422 Poseable Skeleton stamp set. After stamping, I fussy cut around it, colored in and then used Wink of Stella for a little shimmer effect and glossy accents for the eyes. I used foam adhesives for some dimension. Isn't the skeleton a little freaky/scary lookin'? Did it spook you, hehe! 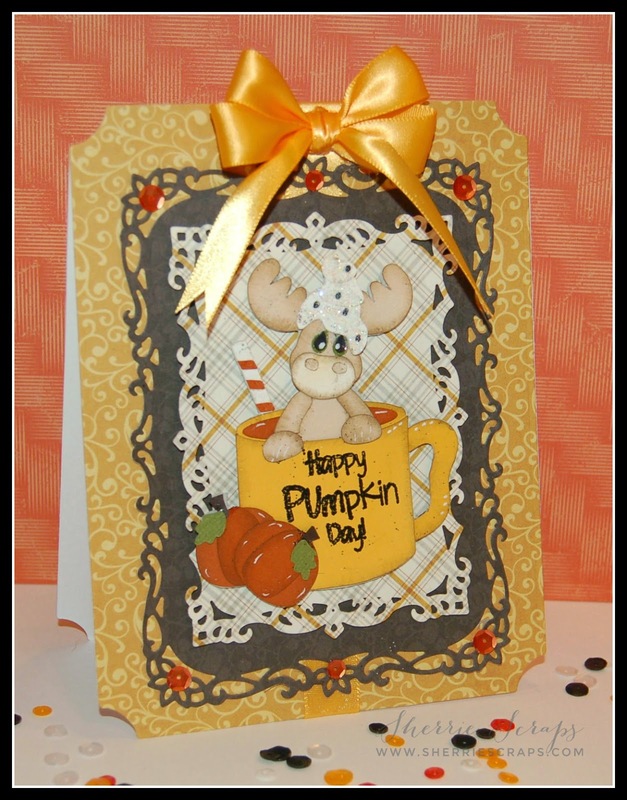 The label and sentiment is from PK-1423 Halloween Sentiments and Labels stamp set. 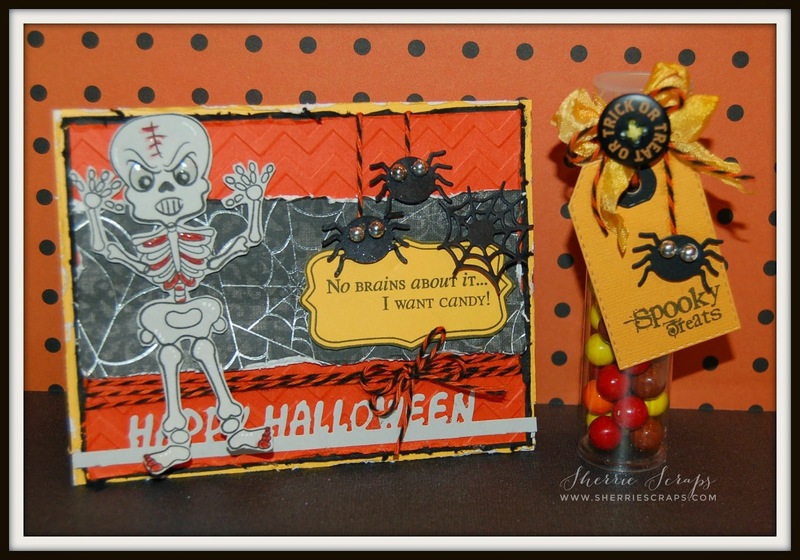 The spiders are from My Craft Spot's Halloween Shapes metal dies set which are hanging from Halloween Orange Licorice Trendy Twine....the googly eyes from my stash. 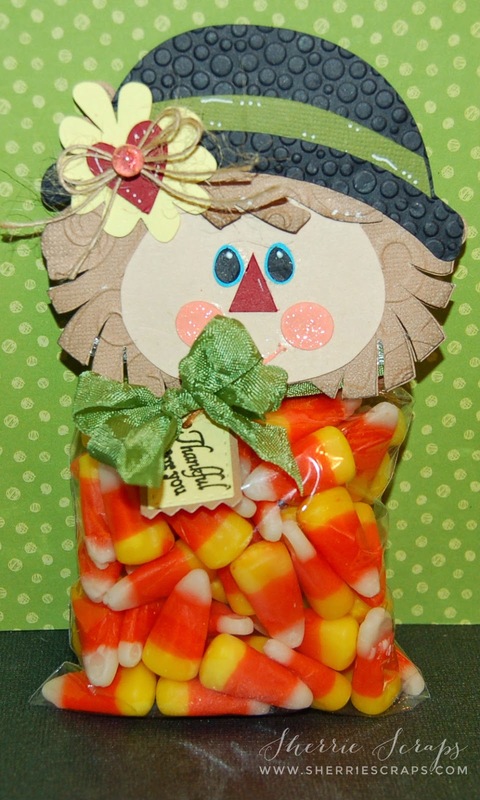 Along the bottom, I wrapped more of Halloween Orange Licorice Trendy Twine and tied a bow. 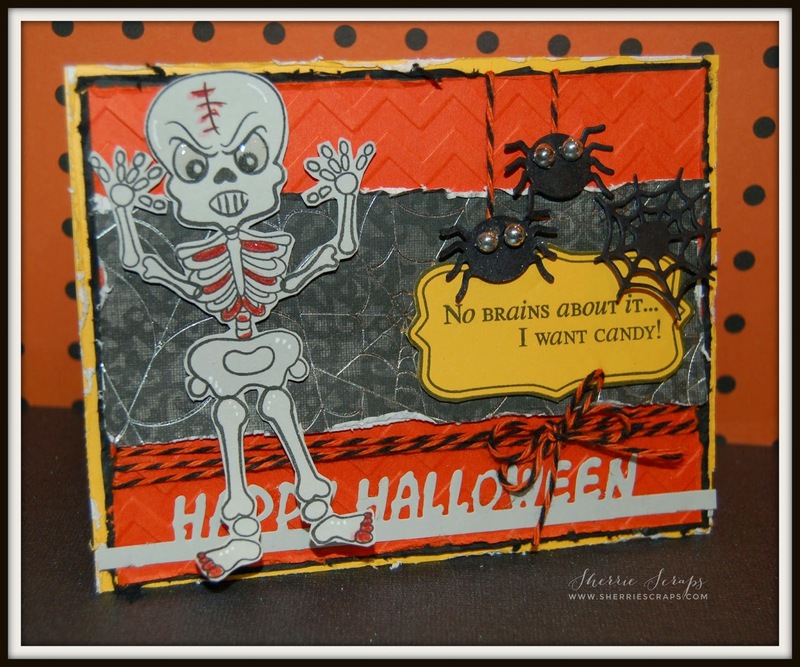 I used My Craft Spot's Fancy Edges Halloween metal die set for the Happy Halloween. 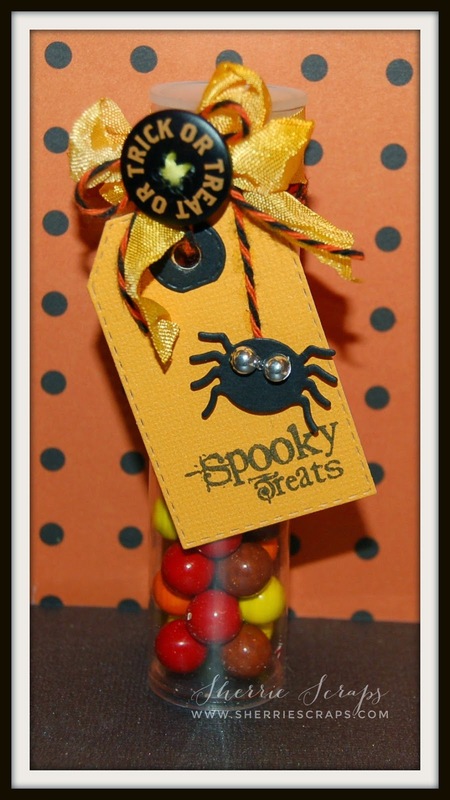 The candy tube was filled with peanut butter M & M's..yum!! 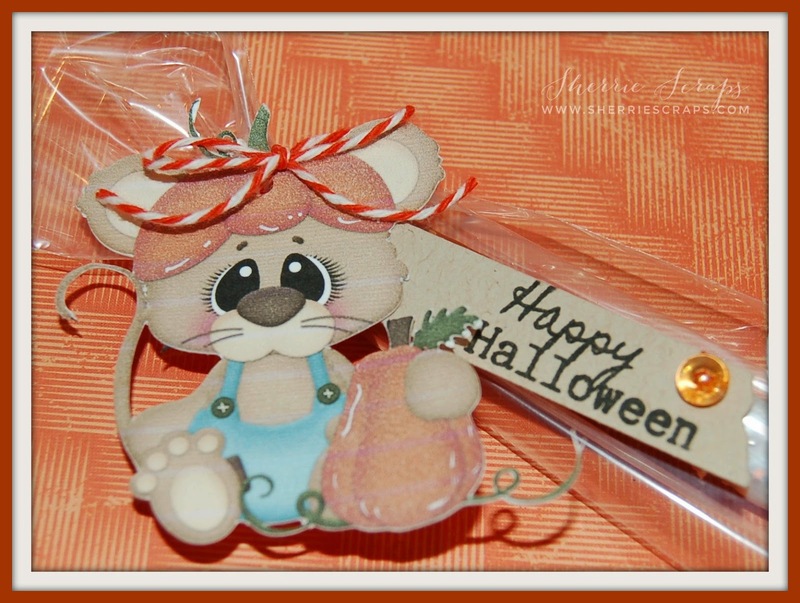 I wrapped Halloween Orange Licorice twine around and tied on a fun little tag. 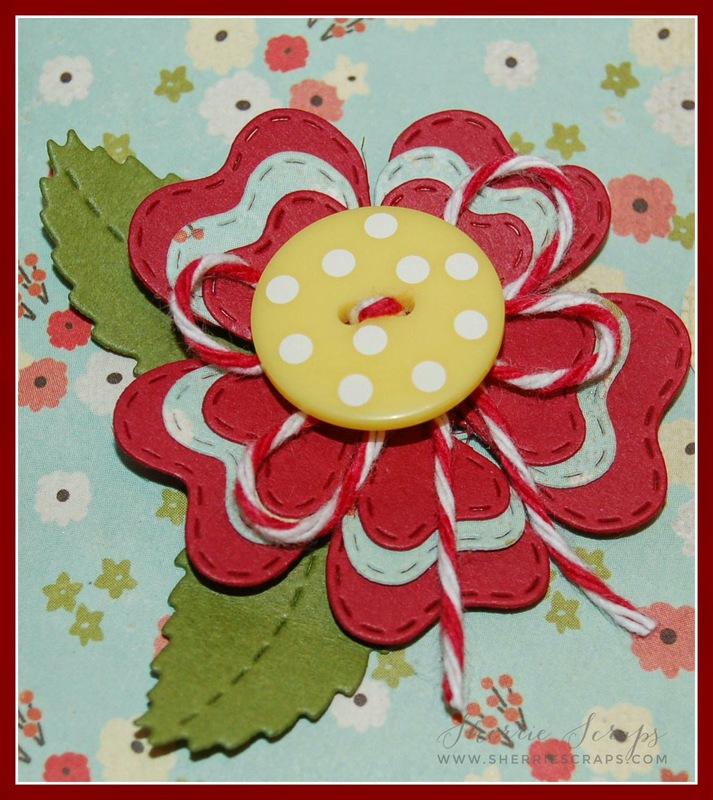 The tag is from My Creative Time's Stitched Round Tab, Arrow Tag metal die. 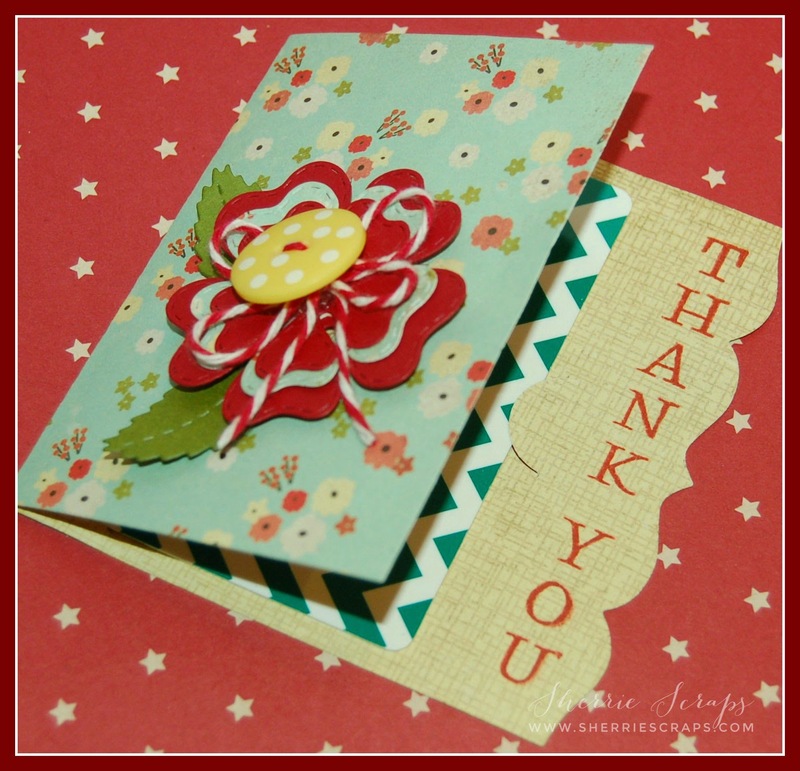 I stamped the sentiment with the Mixed Holiday Sentiments stamp set and again the spider is from Halloween Shapes metal die set. I finished by tying on a Golden Harvest crinkle ribbon bow, a twine bow and fun button from Recollections. We took a drive down to the lake and was it ever pretty! 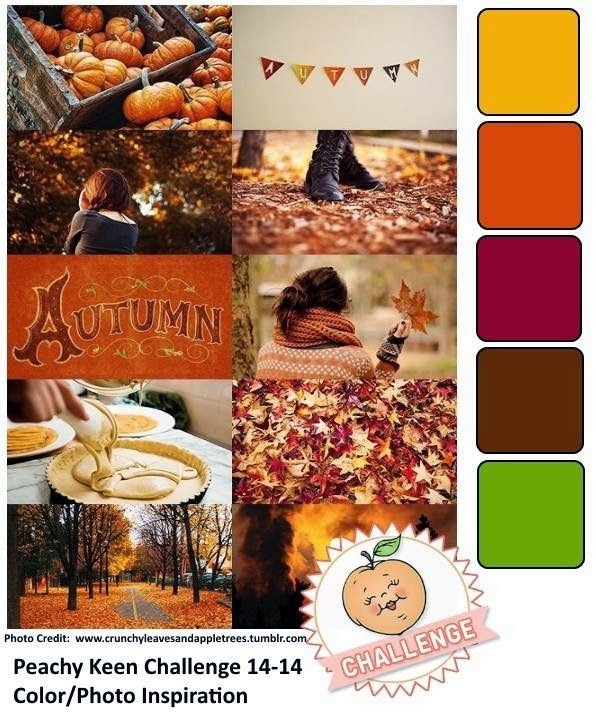 The tree's are just gorgeous right now with the mix of so many fall colors....incredibly beautiful! 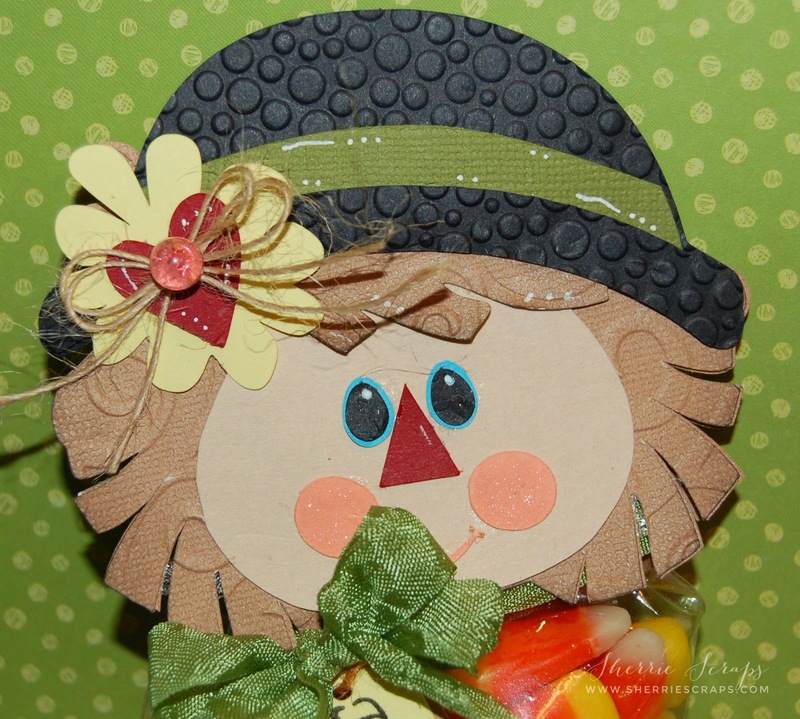 I found this adorable scarecrow girl treat topper at My Scrap Chick and cut it on my Cameo. 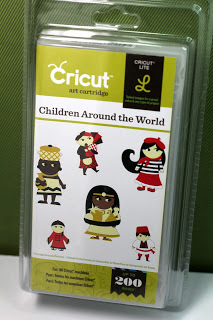 This is such a cute file...it even has 5 other characters for you to cut out and create with. I embossed her hair with the Divine Swirls folder and the hat with the Tiny Bubbles folder for texture. I added a bow using natural Jute String from My Craft Spot to the heart and finished with a skittle in the center. 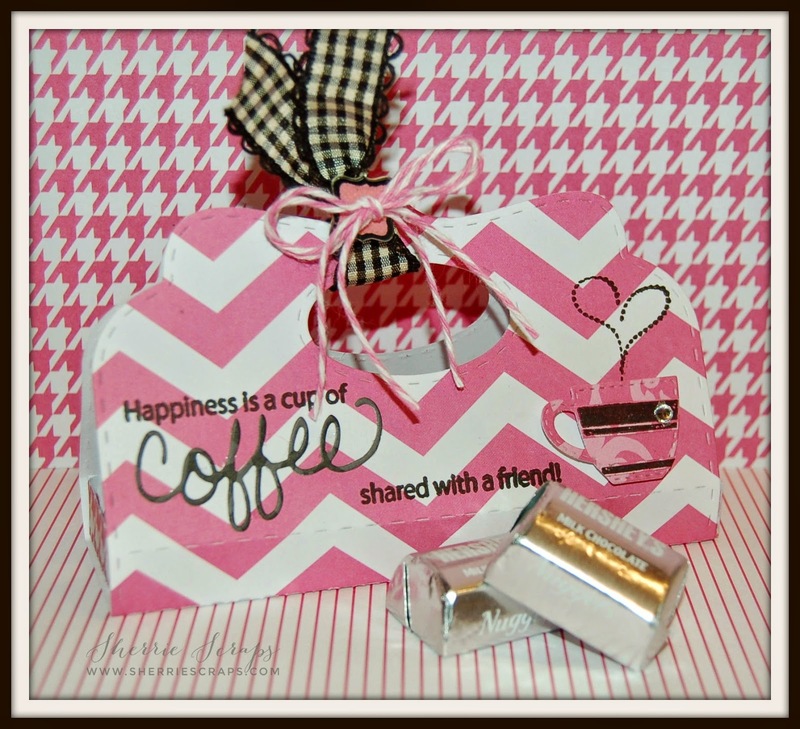 I tied on some 3 Girl Jam Goblin Green crinkle ribbon and a fun tag created with My Craft Spot's Tiny Tags metal die. 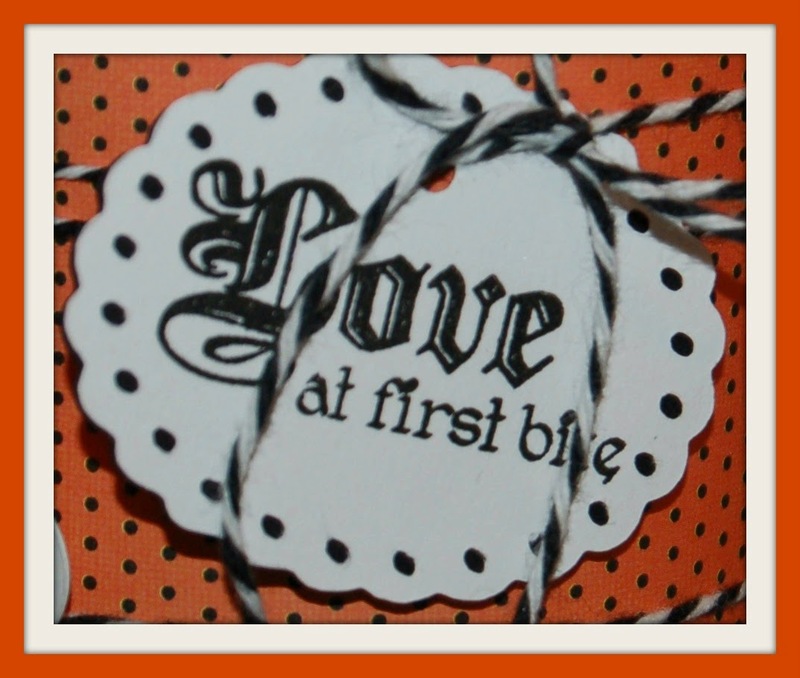 I stamped the sentiment with Tiny Tags 3 stamp set. 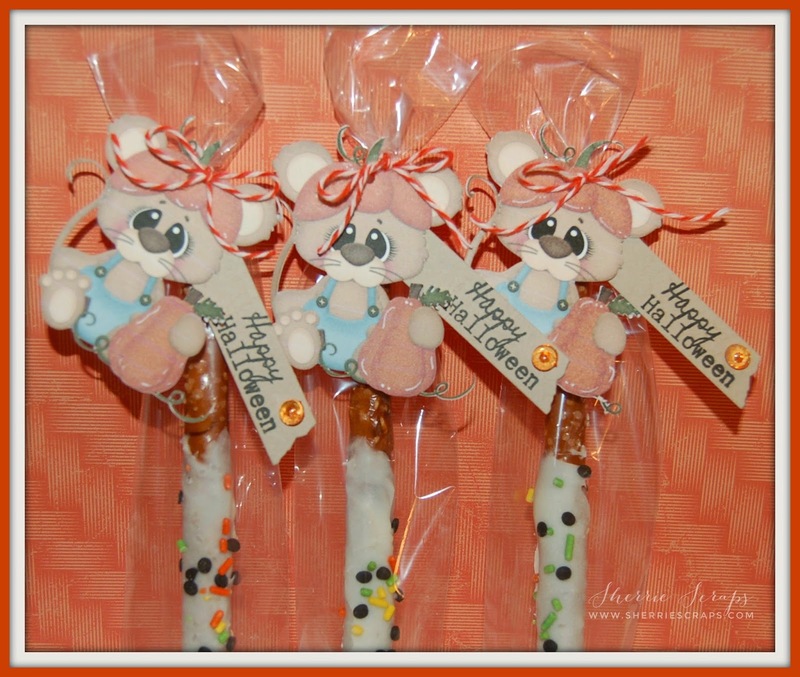 I picked up some pretzel rods at the local grocery store. 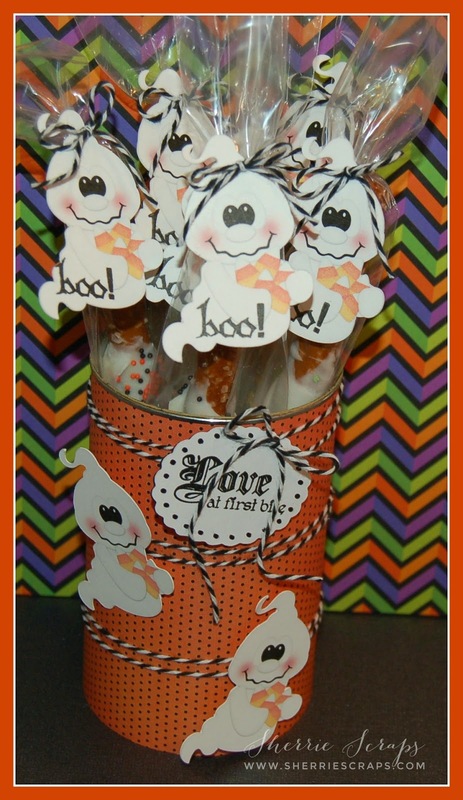 I melted vanilla candy melts by Wilton, dipped them and added fun fall sprinkles to them. 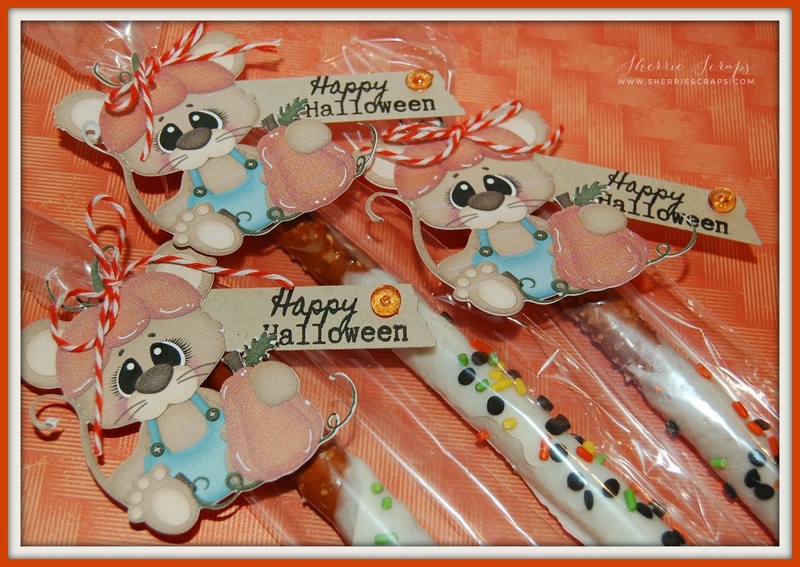 After they set up, I tucked them in the pretzel rod bag and tied with orange twine from my stash on this adorable little mouse image. 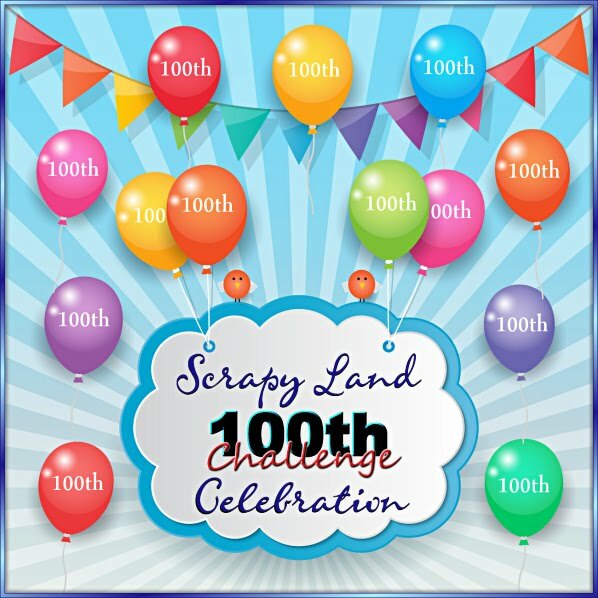 I used this sweet print and cut file that I found over at the Silhouette Store, design #65783 and cut in on my Cameo. The print and cut feature is awesome!!! They seriously went together super easy and so quick which is perfect because the little ones are gonna just tear into it for the yummy pretzel anyway, right? I made 30 of these in no time at all! 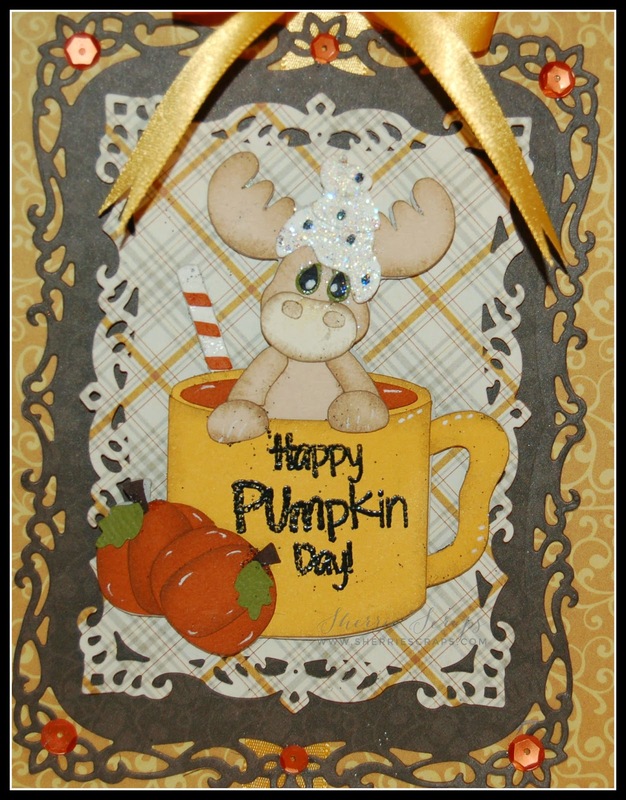 I have a fun card to share with you using a darling cut file from Kadoodle Bug Designs called Pumpkin Spice Moose. Isn't this moose in a coffee mug just adorable?? I cut the pieces on my Cameo, inked them and then put the pieces together. I used foam dots to put it in place and for some dimension. I stamped the sentiment with My Craft Spot's Best Witches To You stamp set. I finished by adding a few sequins and then a pretty satin bow. 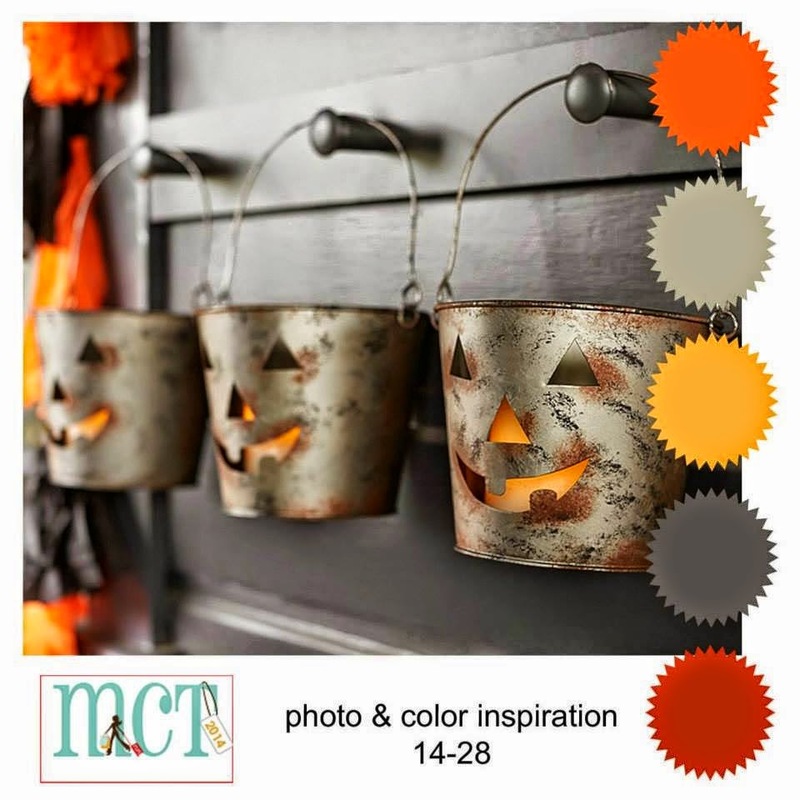 I have decided to take a break from posting something other than Halloween....even though I'm on a roll :) I promise, I will be back with more Fall/Halloween projects, lol! 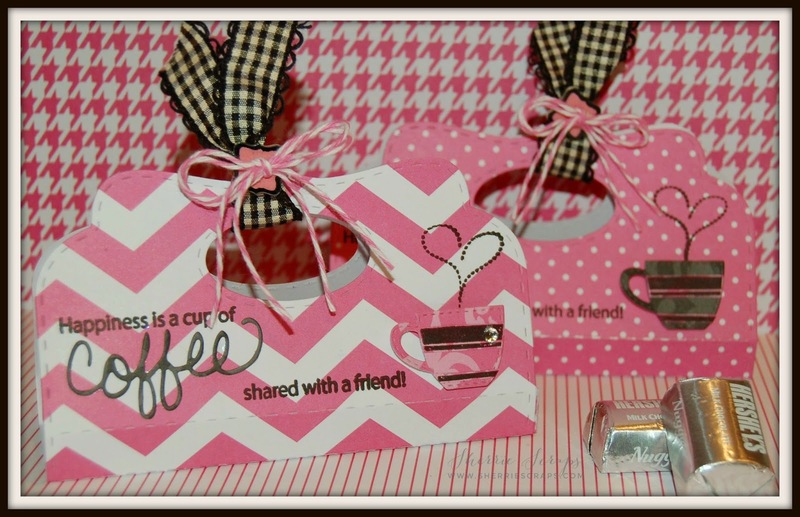 So today, I have a quick little gift card holder to share with you that I made for a dear friend of mine. She was so sweet to me and I wanted to do something back in return. So of course, we all love to craft right....AND.....shop right?!?! 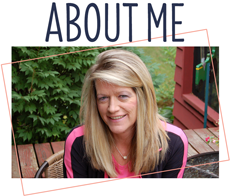 Well, now she can go shop for some fun crafty goodies in appreciation of what she did for me! 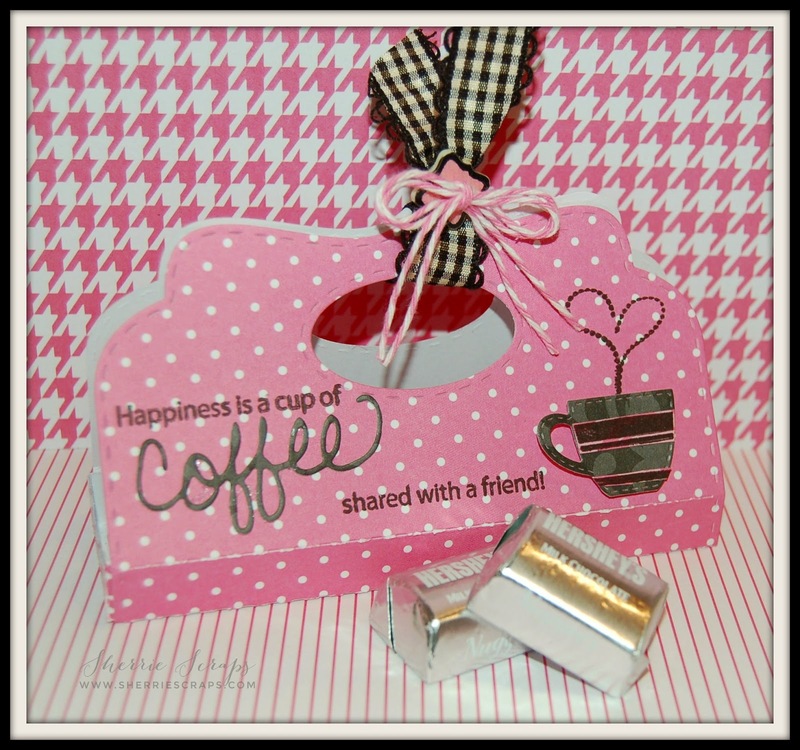 I started with My Creative Time's Embossed Gift Card Holder metal die. 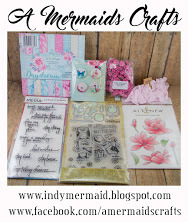 The pretty double sided pattern paper is from Basic Grey. 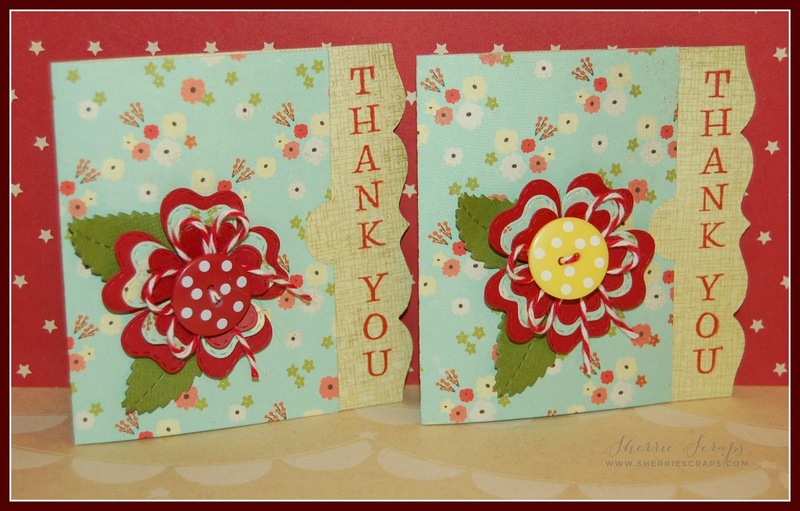 The sentiment along the side is stamped with the Fun Vertical Greetings stamp set. The flowers were created using the Flower Petal metal die and the leaves tucked in are cut from the Stitched Leaves metal die. I attached a fun polka dot button in the center from Recollections and a fun twine double bow using maraschino twine from the The Twinery. I finished by adding a gift card from Michael's Craft Store :) I thought it turned out so cute, so I made an extra one. I am sure it will come in handy, right?